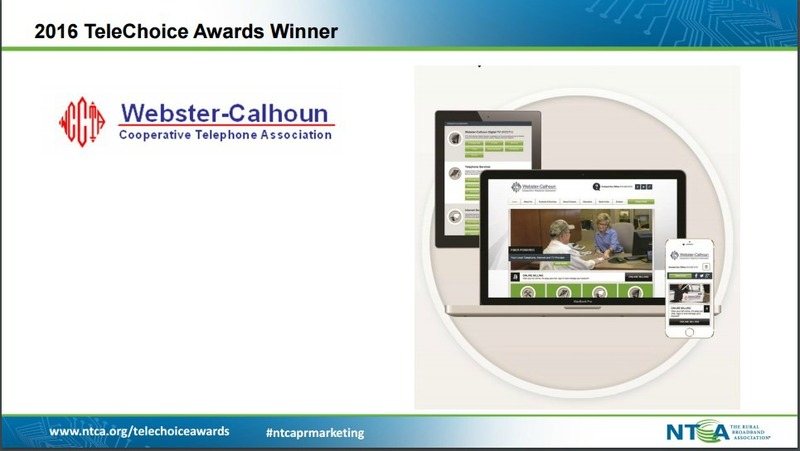 The National Telephone Cooperative Association (NTCA) awarded 33 members with the 2016 TeleChoice Awards at the PR & Marketing Conference held in Charleston, SC on May 2nd. WCCTA received two Telechoice awards for their website and 2015 branding campaign that were designed through a marketing partnership with Spin Markket. “Our goal has been to showcase all the services that we provide with a managed marketing campaign with Spin Markket. Receiving these national awards demonstrates our success with this project,” states Marcie Boerner. 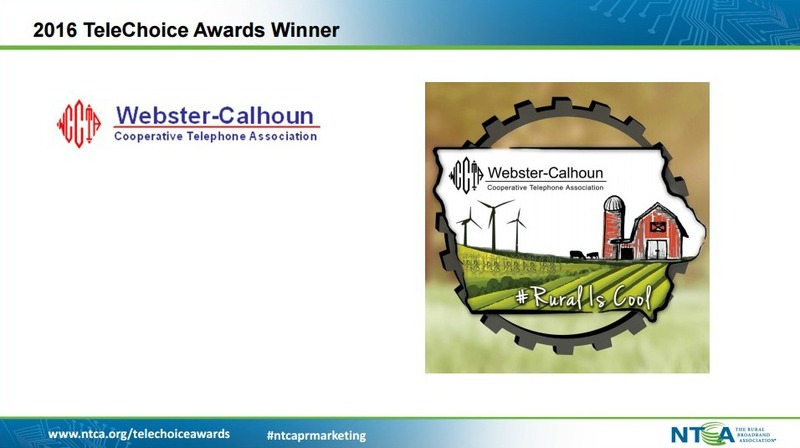 The best and brightest rural telco public relations and marketing pros were recognized as 2016 TeleChoice Awards Winners during the NTCA PR & Marketing Conference, May 1–3, in Charleston, S.C. Attending the conference and representing WCCTA was Marcie Boerner. Winning entries were on display during the conference and will be showcased in an upcoming issue of Rural Telecom magazine. The full list of winners and their work are available online at NTCA. WCCTA walked away with two TeleChoice Awards this year for their new website and their complete branding campaign that was used during 2015. The new website was launched during the first quarter of 2015 and featured a more streamlined appearance along with ease of maneuvering throughout the site. Viewers are able to quickly find information on the phone, internet and high definition TV services available through WCCTA. The site is also designed to make updates and changes quickly so viewers will always find something new when they visit the website. #RuralIsCool was the 2015 theme and this brand was carried throughout the year with a new logo, banners, activities and even a parade float. The 2015 Branding Campaign was launched at the Annual Meeting of Members held in March. Printed materials such as monthly newsletters, banners and events all featured the logo which branded the #RuralIsCool hashtag and theme. WCCTA partnered with Spin Markket on the website design and branding campaign. #RuralIsCool was selected to directly align with a national theme promoting the rural lifestyle of today that has all the modern telecom conveniences that large communities enjoy. After the logo was designed by Spin Markket, the 2015 Branding campaign followed. The new website became live in early 2015 and continues to have updates to keep the information for viewers fresh and current. “We have spent the last couple of years to redefine our marketing and branding at WCCTA. Our goal has been to showcase all the services that we provide with a managed marketing campaign with Spin Markket. 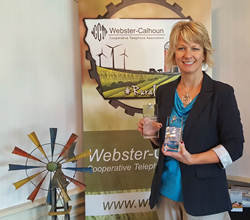 Receiving these national awards demonstrates our success with this project,” states Marcie Boerner, Office Manager with WCCTA. Webster-Calhoun Cooperative Telephone Association is located at 1106 Beak Street, Gowrie, IA 50543. It has a Fiber driven network and provides landline telephone, Internet and digital television service to the Iowa communities of Gowrie, Pilot Mound, Vincent, Thor, Churdan, Knierim, Somers, Barnum, Duncombe, Farnhamville, Badger, Clare, Moorland, Boxholm, Lanyon and http://www.wccta.net.